Reference number for this case: 21-sep-54-LaFleuranderie. Thank you for including this reference number in any correspondence with me regarding this case. Lodève, 23 September. -- A mysterious "flying cigar" reported in the Puy-de-Dôme and in the sky of Rome was seen Saturday, September 18 at 7 p.m. by three credible residents of Lodève, north of the department of the Hérault, as it moved at 1,500 meters of altitude approximately. The object was heading south. The witnesses were able to observe it for nearly five minutes a tapered front, towing a globe brightly lit, fire red and moving noiselessly at the speed of an ordinary plane. Châteauroux. 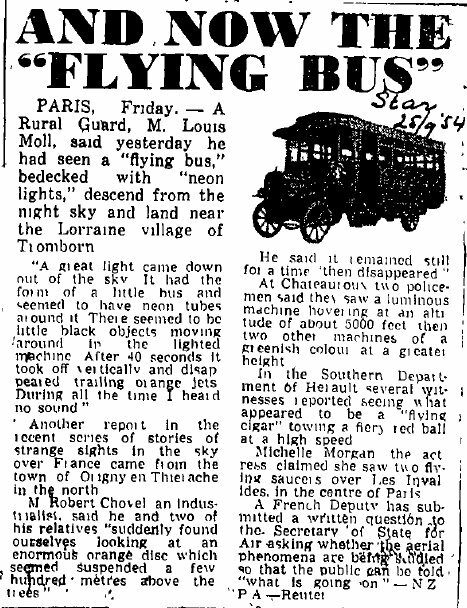 -- Returning from a patrol during the night from Tuesday to Wednesday, two gendarmes of Chateauroux told their leader that they saw, between 9:15 p.m. and 09:45 p.m., a luminous device immobilized in the sky at a height of about 1,500 meters, then two others of greenish color at a higher altitude. The three mysterious objects, after turning at right angles, would have taken the north-west, south-east direction. Nancy. -- Mr. Louis Moll, a rural guard in Oberdorf (Moselle), said he saw Sunday around 9:15 p.m., an intense glow coming from space and touching earth, east of Tromborn. This glow, similar to that of a neon tube, added the guard, and coming from an object of rather large proportions, changed color. It became reddish and Mr. Moll said he saw "black spots" move silently. The object, motionless for nearly 40 seconds, rotated and ascended almost vertically, taking on the appearance of an orange colored and flat ball before disappearing at a dizzying speed in the south-east direction. The total duration of the phenomenon was about one minute. The authorities, which have recorded this statement, opened an investigation. Lodève, September 23. -- The mysterious apparatus, commonly called "flying cigar" reported in the Puy de Dôme and in the sky of Rome was seen last Saturday September 18 at 7 p.m. very precise by three residents worthy of faith of Lodève, in the north of the department of the Hérault whereas it evolved at 1.500 meters of altitude approximately. The object moved towards the south. The witnesses managed to observe during nearly five minutes a pointed front, towing a brilliantly lit sphere enlightened in fire red and moving without noise roughly at the speed of an ordinary plane. Returning from a patrol during the night of Tuesday to Wednesday, two gendarmes of Chateauroux, Misters Courtaud and Peninon stated to their chief to have seen between 09:15 p.m. and 09:45 p.m., above of Fleuranderie, community of Montierchaume (the Indre), a reddish luminous machine, immobilized in the sky at a height of approximately 1.500 meters; then two others of greenish color at greater altitudes. The three mysterious objects, after having veered at a right angle had taken the north-western to south-eastern direction. M. Louis Moll, rural officer in Oberdoff (the Moselle), stated to have seen Sunday around 09:15 p.m., an intense gleam coming from space and touching the ground in the east of Tromborn. This gleam similar to that of a neon tube, added the guard, and coming from an object to the rather vast proportions, changed color. It became reddish and Mr. Moll affirms to have seen "black dots" evolving silently. The object, motionless during nearly 40 seconds, was put in rotation and carried out an almost vertical rise, taking the aspect of an orange ball and becoming flattened before taking the direction of the south-east at a vertiginous speed. The total duration of the phenomenon was one minute approximately. The authorities which recorded this statement opened an investigation. Paris. 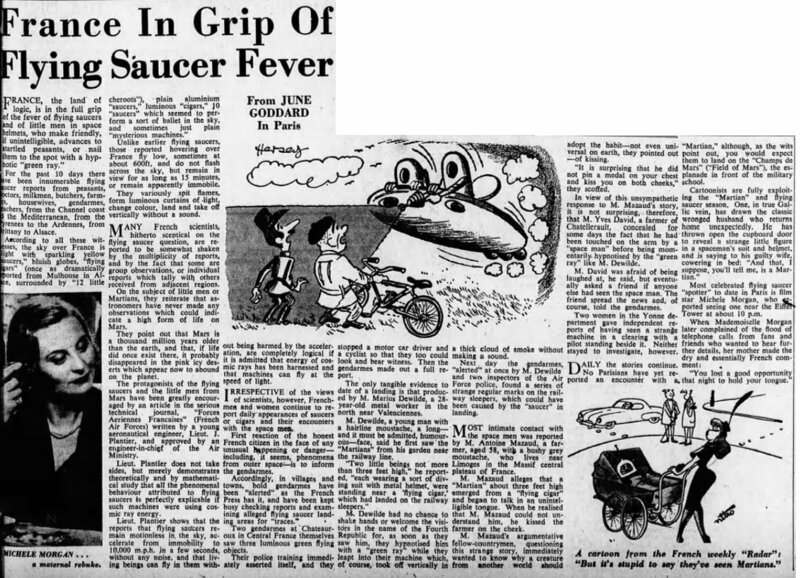 -- The appearance of "flying saucers" and "flying cigars" intrigues the public opinion. This is at least what Mr. Léotard, deputy of the Seine thinks, whom has just asked on this matter a written question to the Secretary of State to the Armed Forces (Air). "2) Whether these "saucers" or "cigars" could be chased to be better observed, so that the public knows exactly if it is a matter of collective autosuggestion to dissipate, or if it is necessary to take account of these phenomena, from the security and national defense point of view." Reported in the Puy-de-Dôme, the Allier, in Lorrain[e] and in the sky of Rome, the mysterious craft werealso observed in the Hérault, Saturday, at 7 p.m., by three Lodève residents. The witnesses were able to see, during five minutes, a fuselage towing a fire red shining illuminated sphere moving without noise, roughly at the speed of an ordinary plane. In addition, returning from a round during the night, two gendarmes of Chateauroux, Misters Courtaud and Peninon, stated to their chief that they saw, between 09:15 p.m. and 09:45 p.m., above Lafleuranderie, a commune of Montierchaume (Indre), a luminous machine immobilized in the sky at an altitude of approximately 1.500 meters, plus two others of greenish color at a greater altitude. The three mysterious objects, after having veered at a right angle, reportedly took the north-western - south-east direction. The mysterious craft, commonly called flying cigar, announced in Puy de Dôme and in the sky of Rome, was seen on Saturday September 18, at 07:00 P.M. very precisely, by three worthy of faith inhabitants of Lodève, in the north of the department of Hérault, whereas it evolved at 1500 meters altitude approximately. The object moved towards the south. The witnesses could observe it during nearly five minutes a tapered fuselage, towing a shiny lightened fire red sphere and moving without noise, roughly at the speed of an ordinary plane. Two gendarmes saw it... And submitted a report with their chief. On returning pf a patrol during the night of Tuesday to Wednesday, two gendarmes of Chateauroux, Mr. Coutaud and Mr. Peninon, stated to their chief that they have seen, between 09:15 P.M. and 09:45 P.M., above Fleuranderie, village of Montierchaume (Indre), a luminous machine hovering still in the sky, at a height of approximately 1500 meters of altitude, then two others of greenish color at a greater altitude. The three mysterious objects, after having turned at a 90 degrees angle, are said to have taken the noth/west to south/east direction. Mr. Louis Moll, rural officer in Oberdorf (the Moselle) stated that he saw, on Sunday (19/0/1954) around 09:15 P.M., an intense gleam coming from space and touching the ground in the east of Tromborn. This gleam was similar to that of a neon tube, he added, and coming from an object of quite vast proportions, and changed color. It became reddish and Mr. Moll claims to have seen black points evolving silently. The object, motionless during nearly 40 seconds, went into a rotation and carried out an almost vertical rise, taking the aspect of an orange ball and flattened before disappearing at a vertiginous speed in the south/east direction. The total duration of the phenomenon was one minute approximately. What does Secretary of State for the Air think about it? These evolutions of mysterious machine of which an increasing number people are or believe being the witnesses however start to intrigue the opinion. Therefore Mr. de Léonard, deputy for the Seine, has just asked the Secretary of State to the Air, in a written letter: 1) If orders were given so that these phenomena are systematically and scientifically studied; 2) If these saucers or cigars could not be chased so that they are better observed, so that the public knows exactly if it is a matter of collective autosuggestion to dissipate, or if it is necessary to take account of these phenomena with the point of view of safety and National Defense. "- In the [department of] Indre, where two gendarmes see several Flying Saucers, make an investigation, and discover weather balloons." Luc Chastan indicates that in the Indre in Montierchaume on 21 September 1954 at 21:15 hours "Returning of a round during the night, two gendarmes of Chateauroux stated to their chief that they saw, between 21:15 and 21:45, above the location "la Fleuranderie" a luminous machine immobilized in the sky, at a height of approximately 1500 meters of altitude, then two others of greenish color at a greater altitude. The three mysterious objects, after having veered at a right angle, reportedly took the direction north/west, south/east." The source is indicated to be my website, "Les OVNI vus de près par Gross Patrick ** http://ufologie.net". The website indicates that on 21 September 1954 in Indre, France, "Unidentified objects were sighted, but with appearance and behavior that most likely would have a conventional explanation. Several objects were observed. Explanation: Balloon." The source is indicated as Michel, Aime, Flying Saucers and the Straight-Line Mystery, S. G. Phillips, New York, 1958. [br1] Article in the regional newspaper La Bourgogne Républicaine, France, 24 septembre 1954. 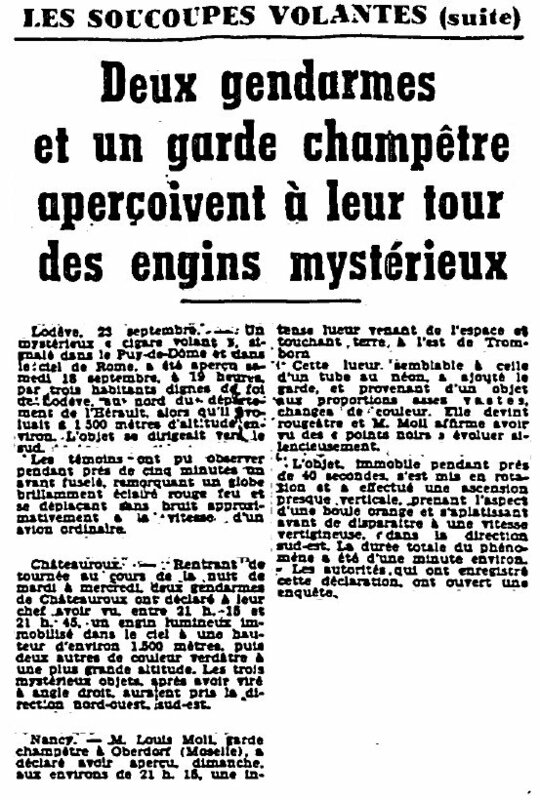 [vm1] Article in the regional newspaper Var-Matin - République, Toulon, France, September 24, 1954. 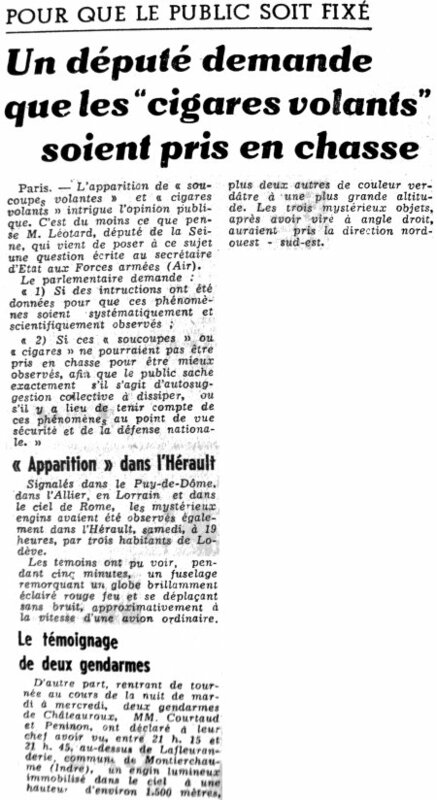 [le1] Article in the regional newspaper l'Est Républicain, France, September 24, 1954. 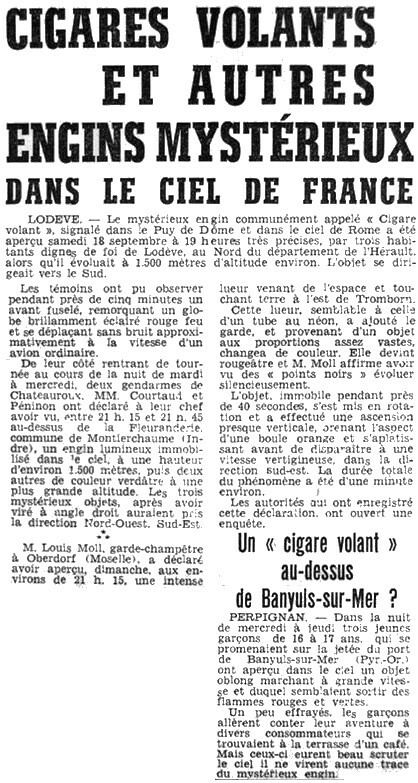 [qh1] "Cigares Volants dans le ciel de France", ("Flying Cigar in the French sky"), regional newspaper article in Le Quotidien de la Haute-Loire, France, September 25, 1954. [am1] "Flying Saucers and the Straight-Line Mystery", book by Aimé Michel, version anglaise de "Mystérieux Objets Célestes", S.G. Phillips publisher, USA, 1958. [am1] "A Propos des Soucoupes Volantes", book by Aimé Michel, réimpression de "Mystérieux Objets Célestes", Planète publishers, France, 1969. [am1] "Mystérieux Objets Célestes", book by Aimé Michel, Seghers publisher, France, page 87, 1977. 1.1 Patrick Gross May 31, 2010 Addition [le1]. 1.3 Patrick Gross October 23, 2011 Addition [in1]. 1.4 Patrick Gross January 18, 2017 Additions [br1], [ub1]. 1.5 Patrick Gross February 25, 2017 Addition [ts1]. 1.6 Patrick Gross September 15, 2017 Addition [sm1].